Traditional waistcoat with silky shine. Traditional waistcoat BERTO in smoke blue is more than a traditional upper part. The elegant waistcoat for men has a very high quality thanks to the silky glossy polyester. The sleeveless jacket has elegant ball buttons that shimmer matt. The evenly distributed on the front jacquard pattern has a high quality and is very harmonious. Contrast seams on the pockets set simple accents. 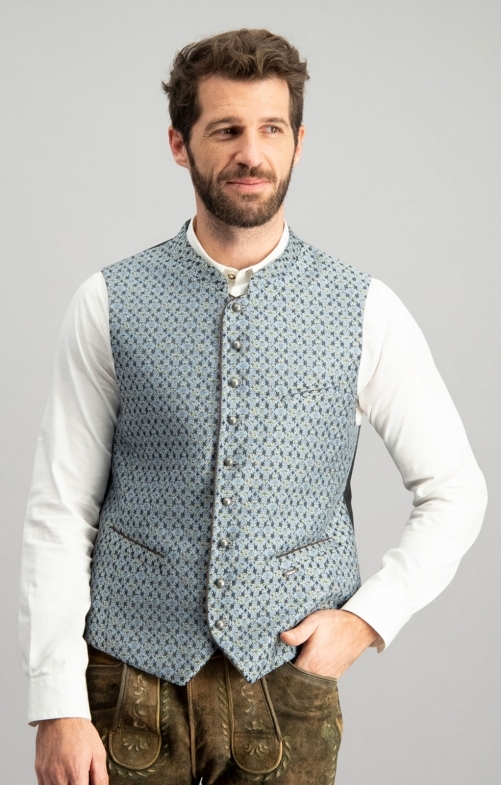 The smoke blue traditional waistcoat looks very fresh with a white shirt and goes perfectly with different leather trousers.